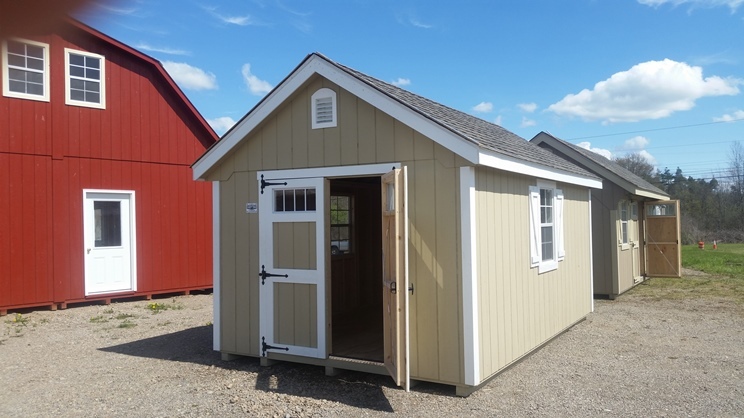 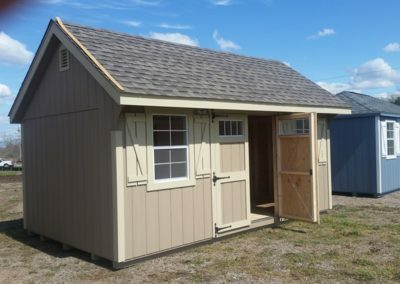 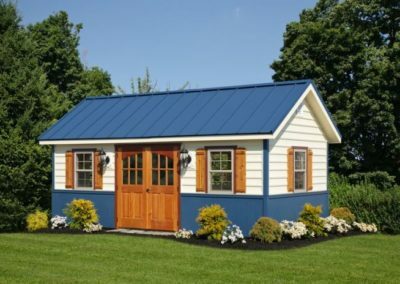 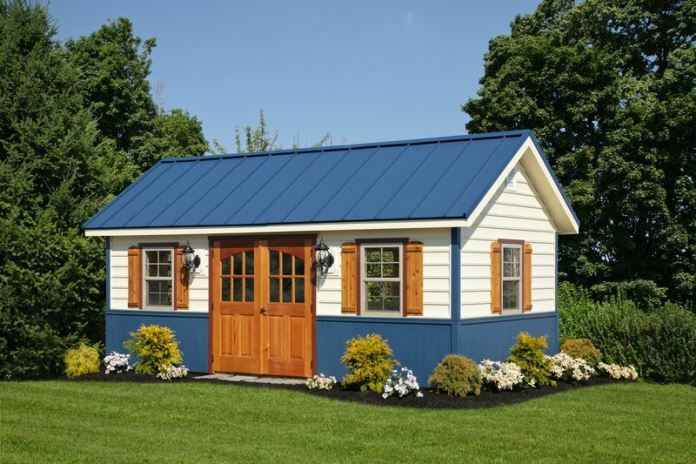 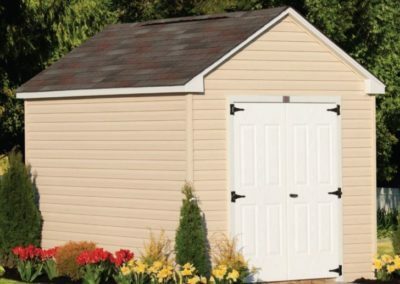 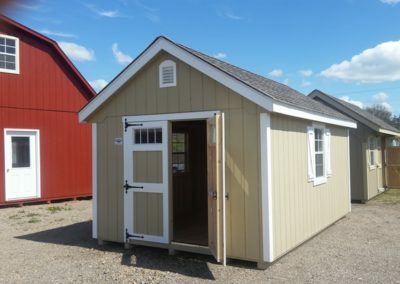 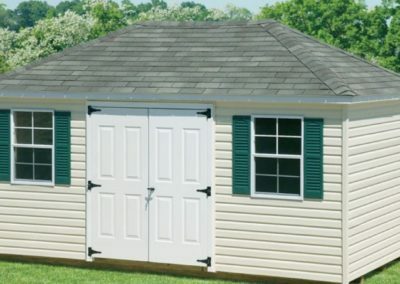 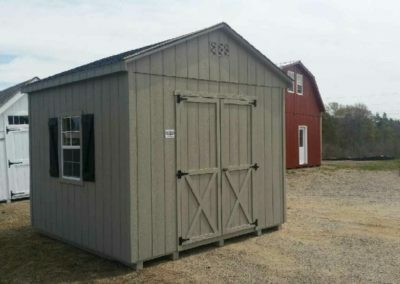 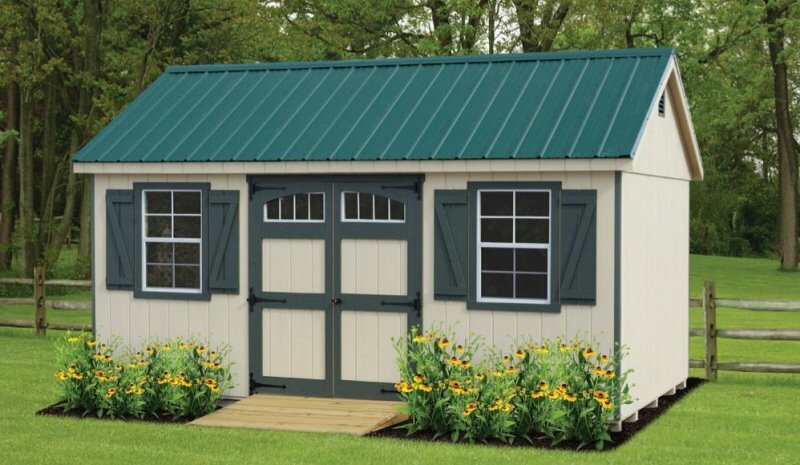 From a spacious storage shed to an inviting garden shed, The Amish Structures offers a variety of different styles, sizes, and flexibility to fit your lifestyle demands. 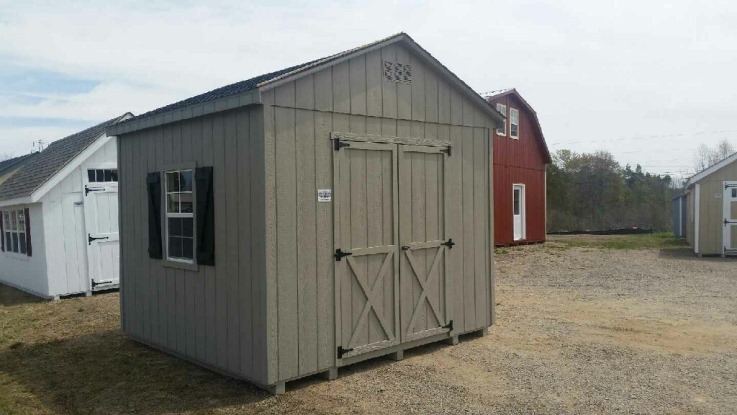 Our Amish Build Sheds and Storage Buildings are built to last and are made with the highest quality around. 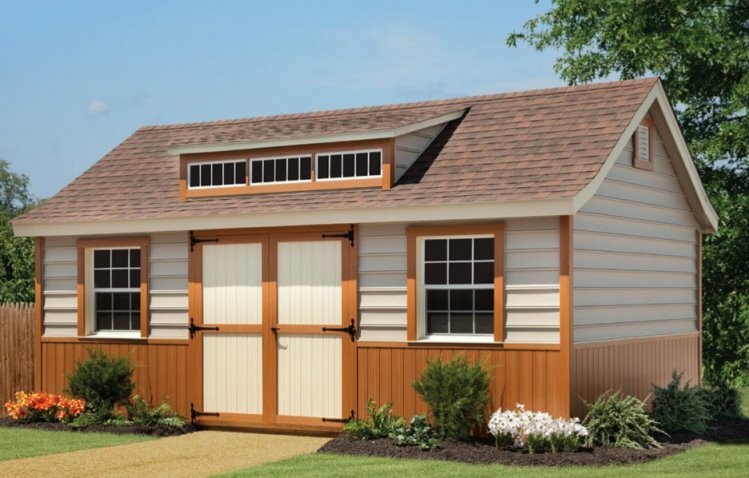 Check out some of our most popular styles below along with our photo gallery, then contact us to get started. 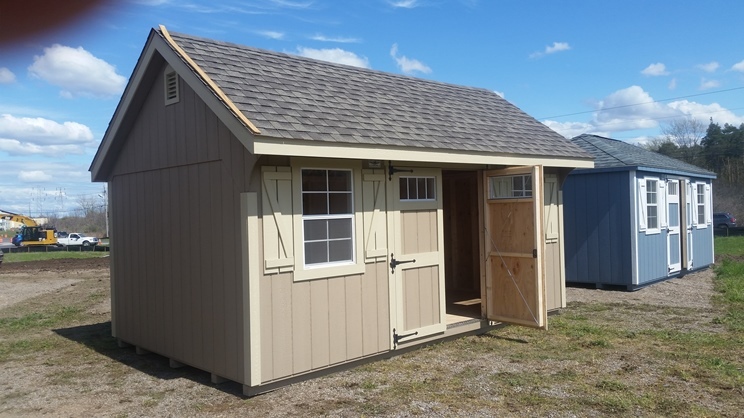 The Amish Structures delivers sheds to most of New York State including Syracuse, Rochester, and Albany. 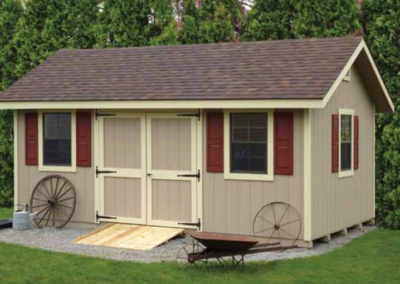 No matter where your home or farm is located we’ve got answers to your storage building needs. 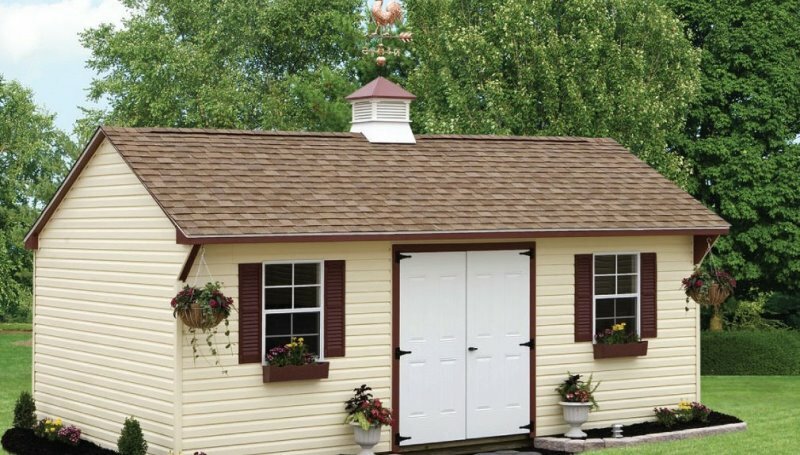 Also, please note that all buildings can be custom built to your style and size needs and buildings are in no way limited to what is on this page. 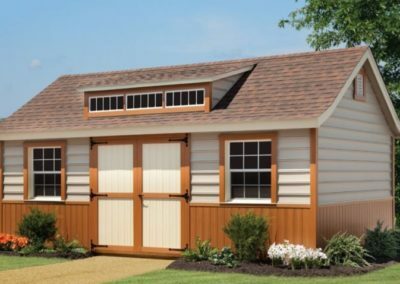 With many different design options, our Classic Collection is a perfect choice when you want to enhance your landscaping while satisfying your storage needs. 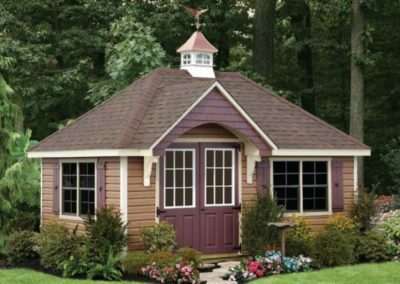 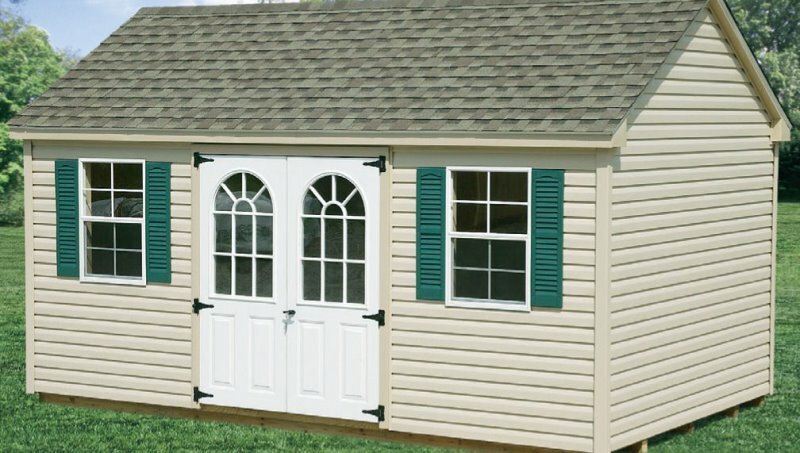 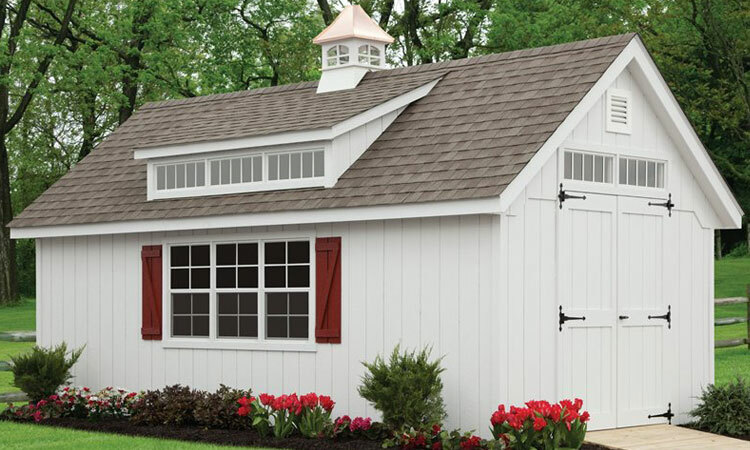 Choose the colors, features, and finishing touches that will set your shed apart from all others. 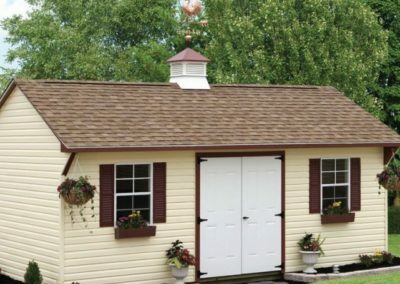 Shown with white T1-11 siding, white trim, red window trim, weathered wood shingles, 8’ New England dormer, and large window cupola. 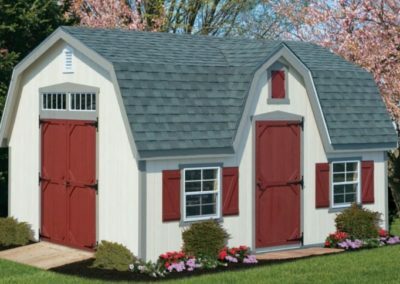 Shown with white paint and chestnut roof line and windows, along with buckskin trim, and weathered wood shingles. 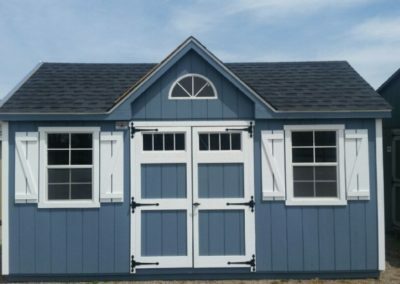 Shown with clay T1-11 siding, white trim, black shutters, black shingles, 8’ New England dormer, and large window cupola. 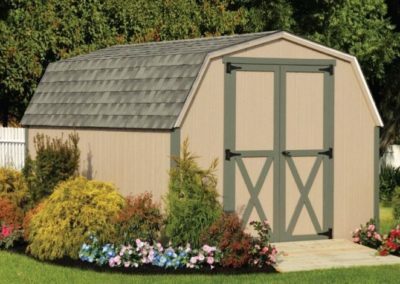 With clean lines and an appealing classic shape, the A-Frame is a stylish storage solution that fits perfectly into suburban landscapes of today. 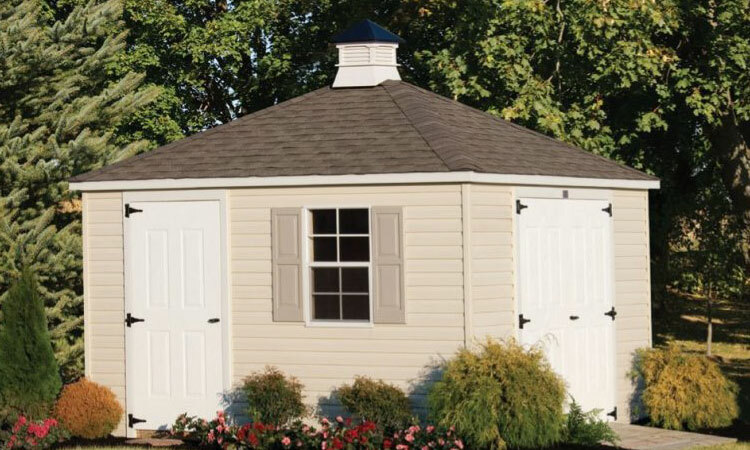 Add a cupola for a charming finishing touch. 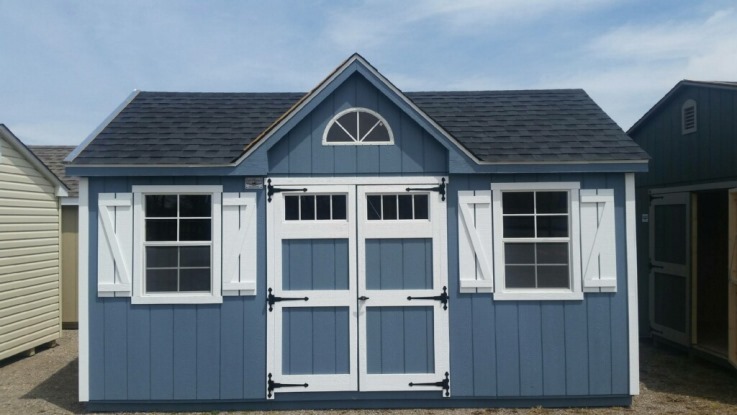 Smart panel painted Navajo white, buckskin trim, weathered wood shingles, and red doors and shutters. 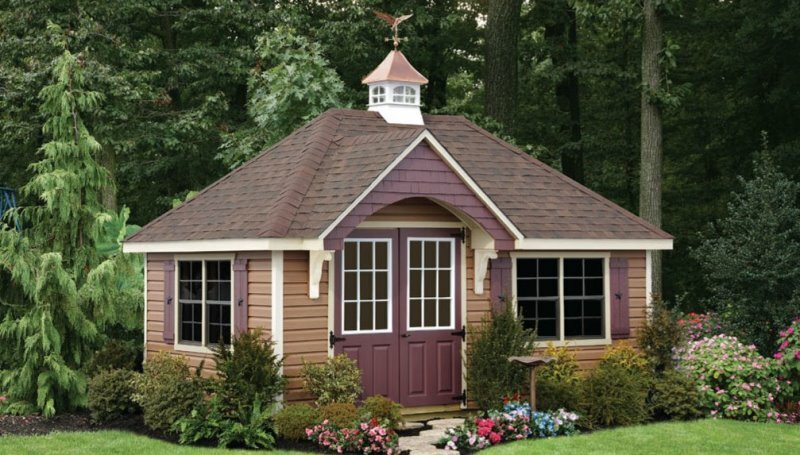 Shown with sandstone beaded vinyl, white trim, brown shutters and boxes, weathered wood shingles, and large window cupola with copper. 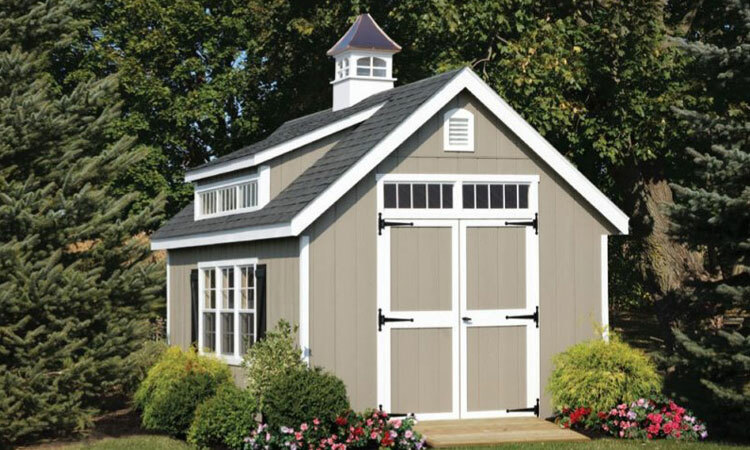 Shown with sage vinyl, white trim, and black roof with 6’ dormer. 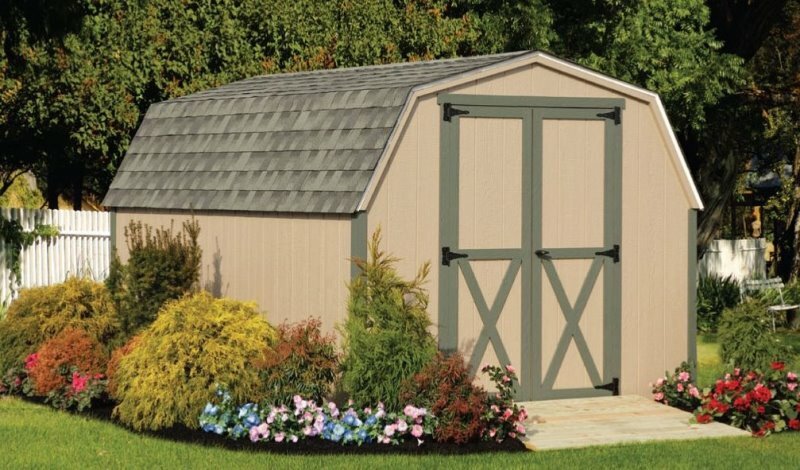 Imagine stepping into your gardening shed and being greeted by warm sunlight and the fragrances of ﬂowers. 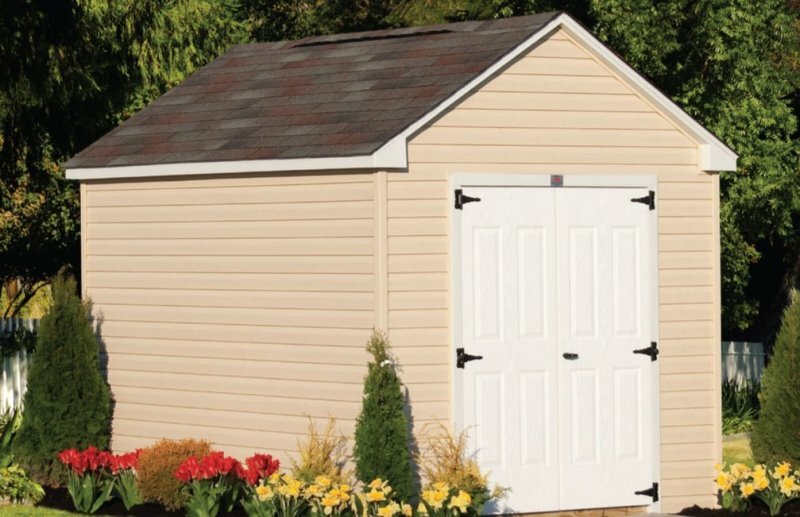 Our Manchester Garden Sheds provide a warm and inviting place to store your tools as well as care for your plants. 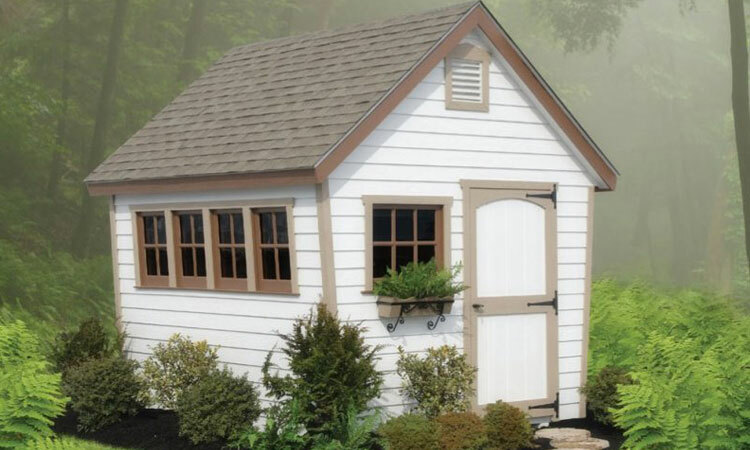 During winter months, your bulbs will start to thrive in our safe and enclosed environment. 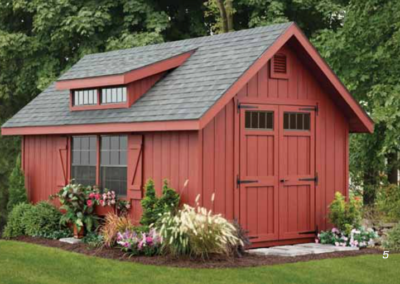 Shown with red paint, white trim, black doors and shutters, and black shingles. 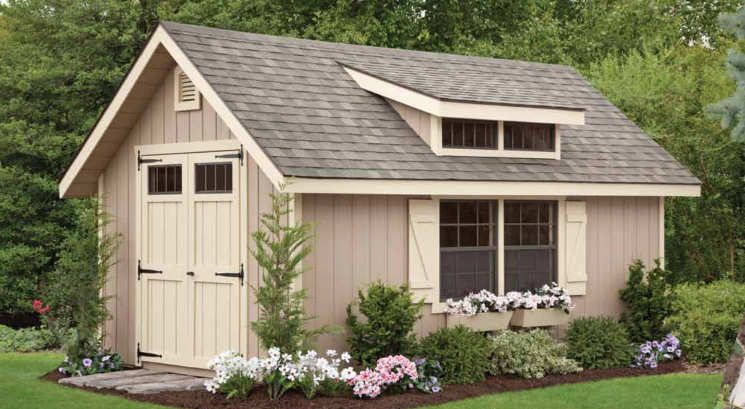 Shown with Mojave stone front, sage vinyl and dormer, ivory trim, brown doors and shutters, barkwood shingles. 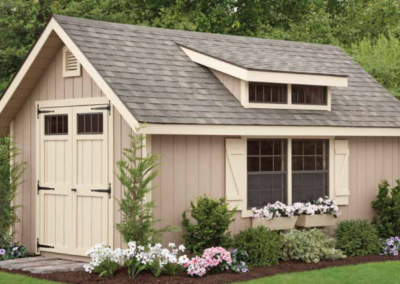 Shown with linen vinyl, khaki trim, and black dormer and shutters. 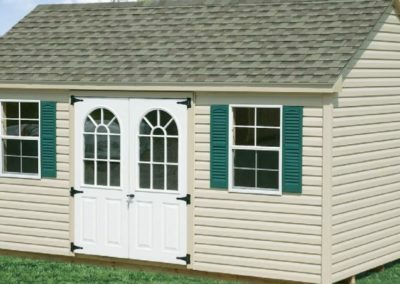 Shown with cream paint, white trim, green shutters and doors, and black shingles. 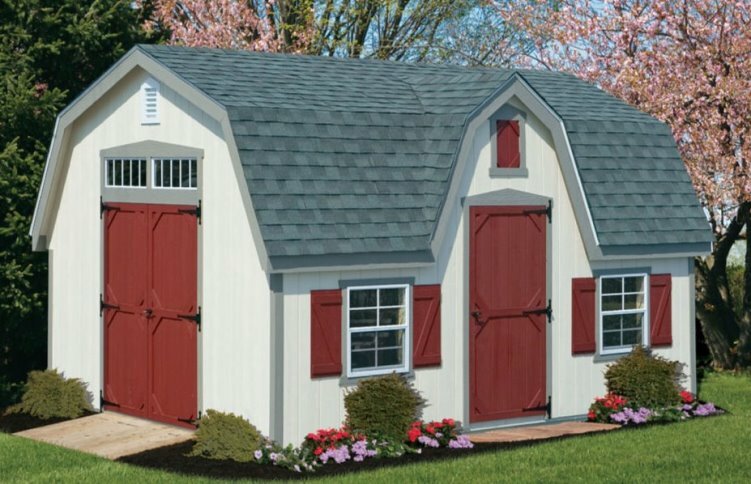 Shown with white paint, chestnut trim, buckskin shutters and door trim, and barkwood roof. Shown with red paint, brown trim and shutters, and barkwood shingles. 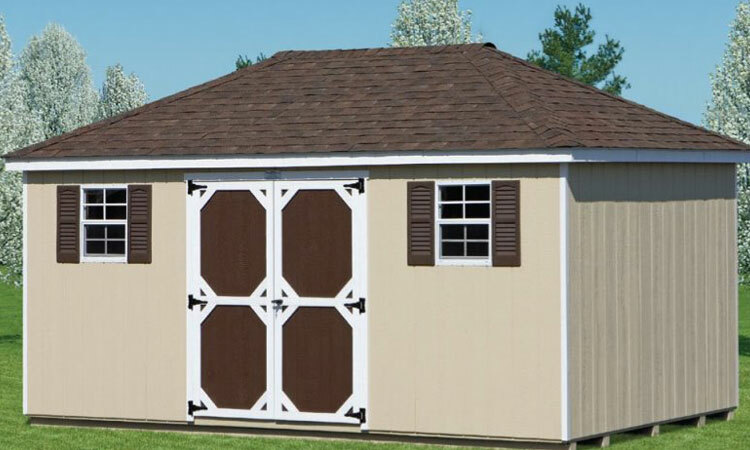 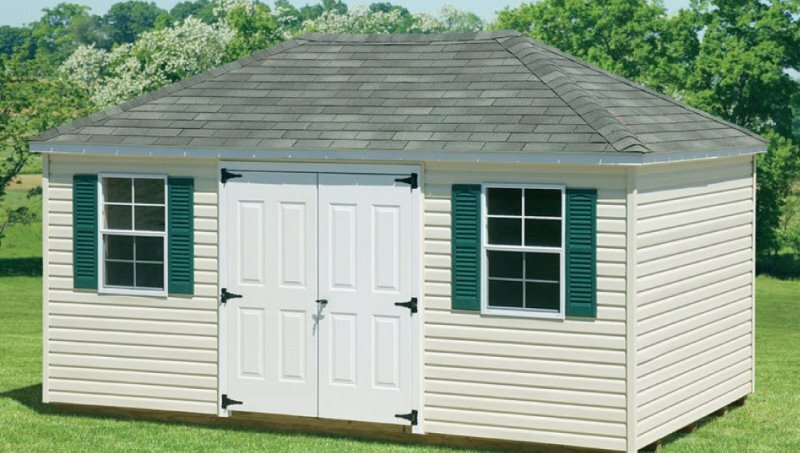 For an added touch of class, our Hip Roof Collection is a great choice. 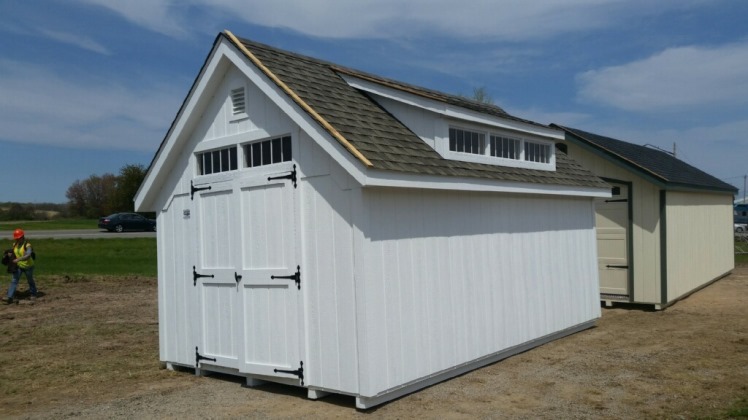 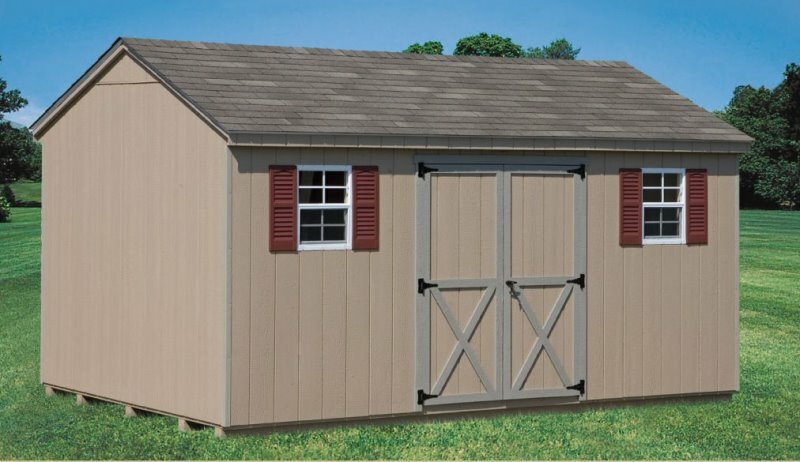 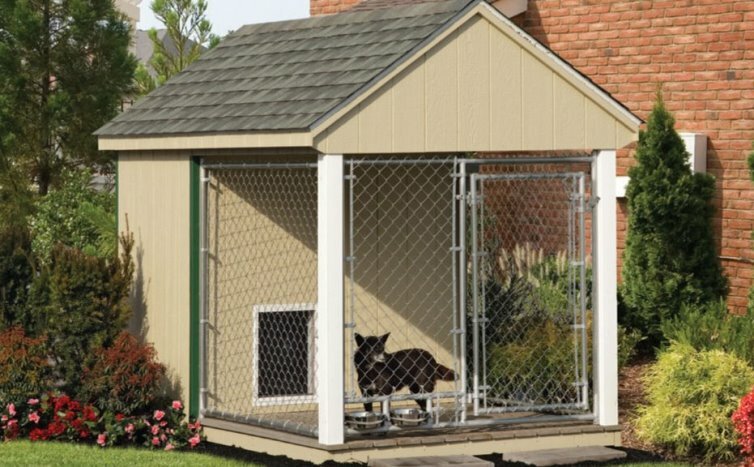 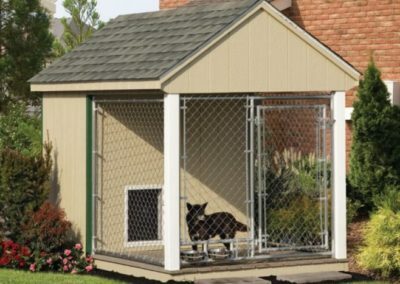 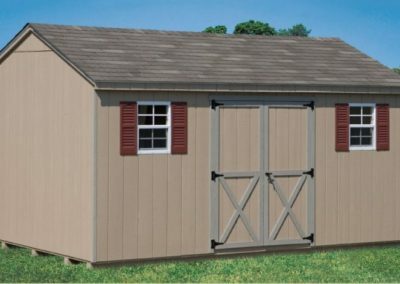 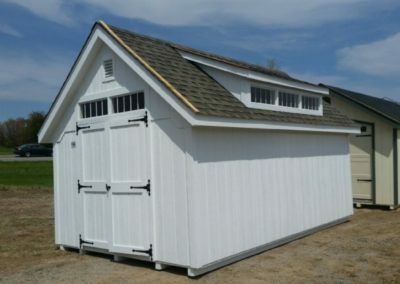 Available in a variety of sizes and styles, this standapart design elevates any storage shed to something quite extraordinary. 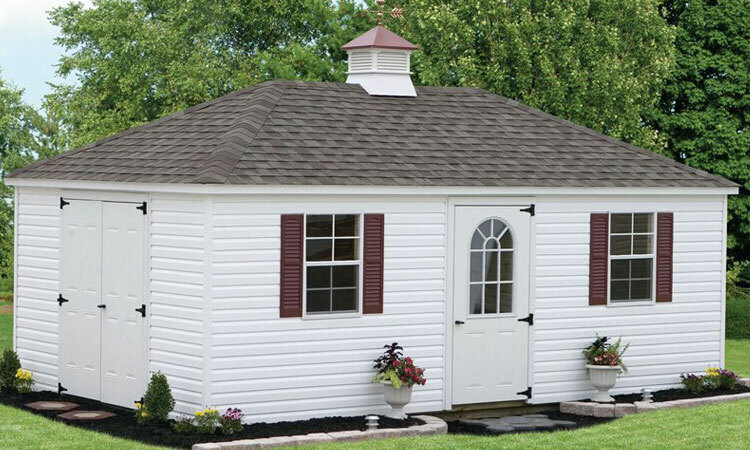 Shown with white vinyl, white trim, red shutters, weathered wood shingles, and medium cupola. 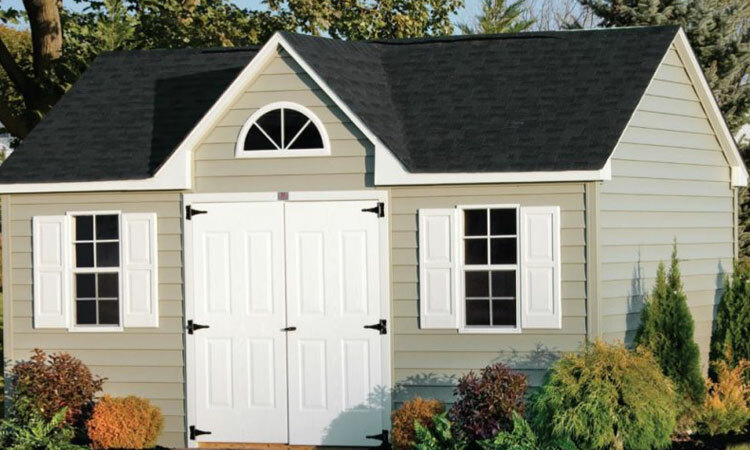 Shown with beige paint, white trim, brown shutters and doors, and hickory shingles. 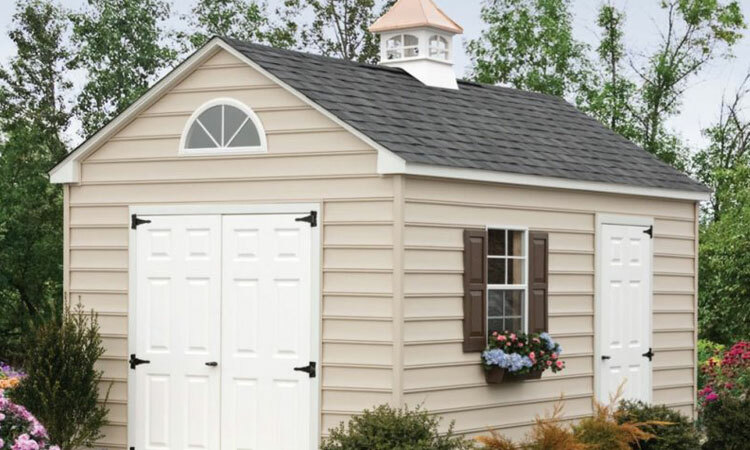 Shown with ivory vinyl, white trim, almond shutters, weathered wood shingles, and medium cupola. 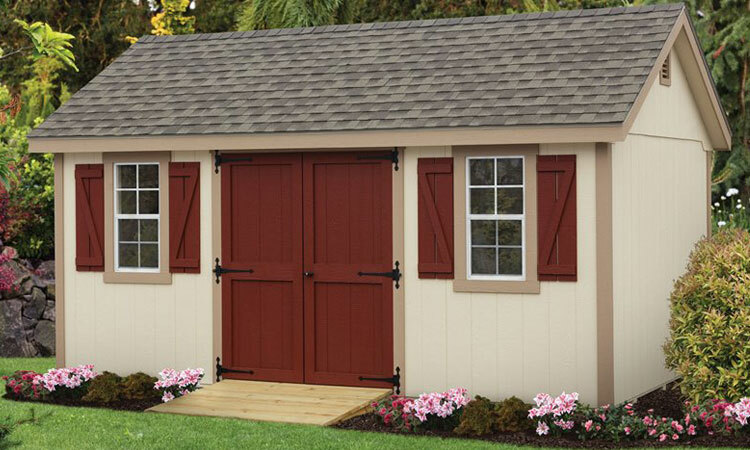 Shown with clay paint, beige trim, burgundy door and shutters, and weathered wood shingles. 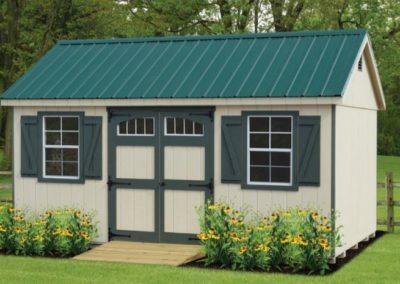 Shown with clay siding and green trim with green shutters, weathered wood shingles, and stainless steel hidden hinges. 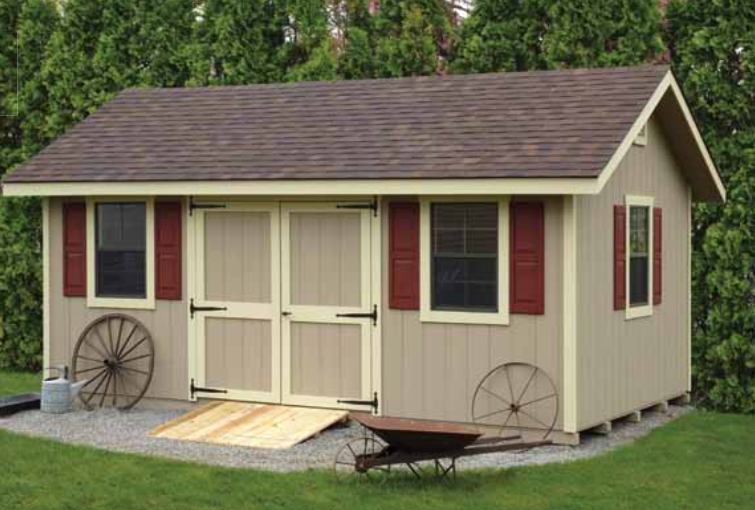 Shown with sandstone siding, sandstone trim, and weathered wood shingles.